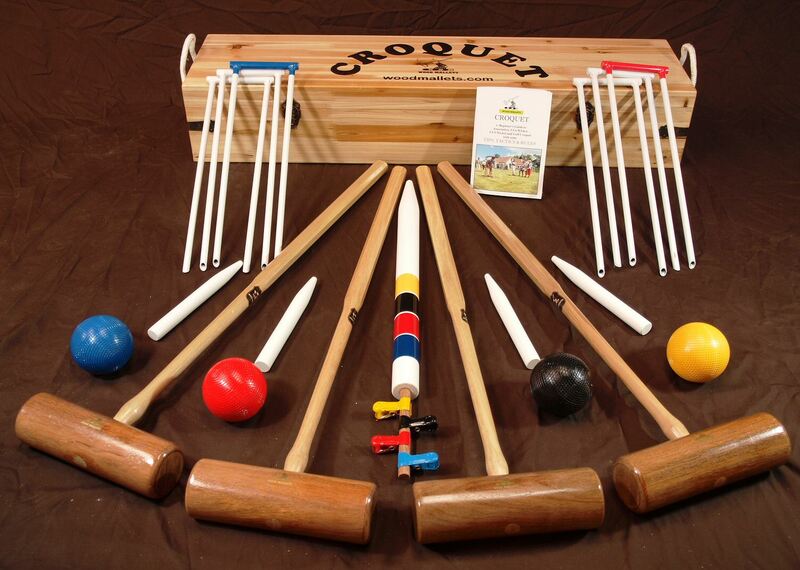 The Garden croquet set for 4 Players is ideal for home garden croquet with regulation sized balls and hoops. Although the mallets do not include the brass rings or sighting lines provided with the Hurlingham set, they are made from the same timber. The Garden Set mallets have an overall length of 36” and an average weight of 2lb.14oz. We offer a number of accessories to go with this set. The secondary colours are worth having if more than 4 people will be playing at the same time, or when playing with 2 balls. Full-size croquet set in a traditional solid wooden storage box. This set is supplied with George Wood Garden mallets. This is probably the best value full-sized boxed set available and is ideal for family use. Includes 4 hardwood mallets with octagonal ash handles, regulation size and weight 16oz balls, steel hoops, corner pegs, wooden winning post and rules. Packed in a high quality solid wooden box with latches and rope handles. An excellent set, designed to provide years of family fun.